The JOK II is a CE-marked Divers Recovery Harness. It permits recovery of a fully-kitted diver from the water in air diving or bell diving conditions. 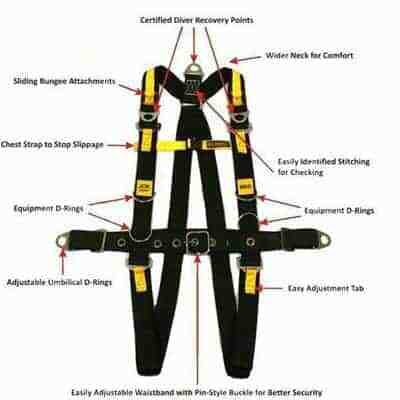 Lifting can be via a rear of neck D-Ring or with a spreader bar across the two front of harness lifting points. The under-leg straps are essential for diver recovery. Also it is important to differentiate between certified lifting points and lightweight tool attachment points. The special profile-cut D-rings make no doubt which to use, and assist the diver in poor visibility or stressed conditions. The Umbilical connection point is also load tested. It is adjustable as to its position, which allows divers of different sizes to slide it into position and lock it in the most suitable place.